With the Atlantic Ocean on the eastern side on the Gulf of Mexico to the west, as well as a multitude of lakes, reservoirs, rivers, marshes, mangroves, and more up and down the state, Florida is undeniably one of the best locations in North America for kayaking. Another advantage of the Sunshine State is that it enjoys wonderful weather all year long, so outdoor enthusiasts can enjoy kayaking whenever they like. Florida has dozens of excellent kayaking spots all around, but the Everglades stand out as one of the very best. This tropical wetlands region covers a large part of southern Florida and is known for diverse wildlife and a wide range of ecosystems from sawgrass plains to swamps, marshes, bays, and more. It's an amazing place to explore by kayak, with an almost endless array of routes and adventures just waiting to be experienced. Since the Everglades is such a popular kayaking location in Florida, seasoned kayakers have identified some of the very best spots over the years. Here are some details on a few of the most popular kayaking locations in the Florida Everglades. Located in the Everglades National Park, this canoe and kayak trail has proven highly popular with countless visitors over the years. With easy access and offering potential sightings of turtles, fish, birds, and even alligators, the Nine Mile Pond trail is actually only five miles long in reality but can provide a bit of a challenge on days with a strong breeze. Stop off at the Flamingo Visitor Center in the Everglades National Park to learn more about the different Flamingo kayak and canoe trails you can enjoy. Taking in various lakes and waterways and offering some terrific views of the Everglades, these trails are well suited for both beginners and intermediate kayakers. This maze of mangrove trails can be a real challenge, even for seasoned kayakers, so can only be recommended to people who know what they're doing and have a good amount of kayaking experience behind them or an expert guide to lead the way. The route takes around 6-8 hours in total and features some impressive mangrove tunnels and backcountry chickees. Just remember to pack some bug spray, especially in summer. Various kayaking companies operate in the Everglades, providing tours, rentals, outfitting services, and more. Here are some of the top rated kayaking companies to choose from. A family owned and operated company provided an authentic, friendly Florida kayaking experience, Jenny's Eco Everglades Wilderness Tours runs motorboat and kayak tours around the national park in search of alligators, fish, birds, and even bobcats from time to time. 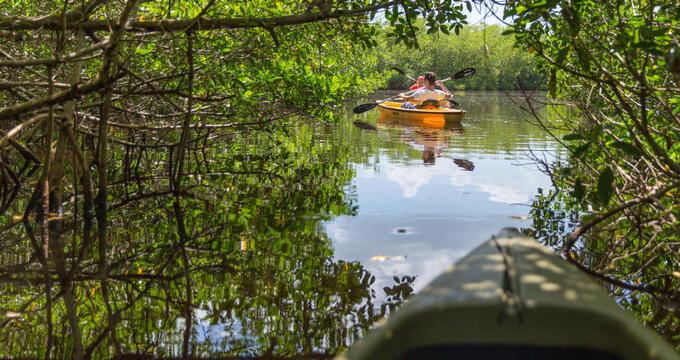 One of the most highly recommended tour companies in the Everglades, Garl's Coastal Kayaking runs kayak rentals and full guided tours all around the Everglades National Park. Featured in a host of magazines and outdoor guides like Lonely Planet and the New York Times, these tours provide thoroughly professional, world class kayaking in one of Florida's wildest locations. Tour The Glades runs an array of private, educational, entertaining kayaking tours of the Everglades. With several different tours to choose from, including backcountry and 10,000 Islands tours, as well as birdwatching and wilderness tours too, there's a lot of options for kayaking with this company and you know you’ll be guaranteed a great experience every time.